Khandala is an amazing hill station that provides you anytime retreat from the hustle and bustle of toiling city life. In spite of being a small hill station, Khandala serves as a source of distinct enchantment for those who plan to spend their honeymoon in Khandala. One reaches Khandala by covering an altitude of 625 meters above the sea level. The existence of Sahyadri Mountains adds extra charm to this hill destination. As you come for your Khandala honeymoon tours, you can get mesmerized by various lakes such as Bhushi Lake, Tugali Lake, as well as Lonavala Lake. Honeymooners having penchant for adventure can try out the popular rock climbing adventure. Or else, you both can go for excursions to enjoy to the fullest all that Khandala honeymoon packages have for you. We’ll acquaint you with all the significant attractions that form your Khandala tours. You both would definitely be more than enthralled to find numerous forts that are peppered over the Khandala hill station. You can visit the Manoranjan Fort, close to which lies the Bhairavnath Temple. Or else, you can also be taken aback by the sight of Shrivardhan Fort or Visapur Fort or Rajmachi Fort, or Lohagad Fort, etc. that would add a historical appeal to your honeymoon in Khandala. Tunga Fort is adorned by the serenity of Pavana Lake and Korigad Fort tells you the story of the battles and rivalries between the British and the Marathas. 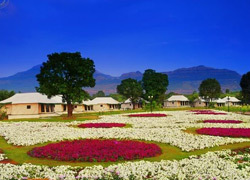 These forts play a vital role in revamping your Khandala honeymoon packages. Apart from visiting forts, you can also astound yourself completely by taking the move of exploring different caves. Bedsa Caves make a nice display of remarkable pillars with pictures of lions over them. Karla and Bhaja caves showcase the absolutely captivating Buddhist architecture. In this way, you can make the most of your honeymoon in india. For newly weds, Khandala also has breathtaking Kune Waterfalls to refresh their senses. Reaching the Monkey Hill and taking views around it or visiting Sakur Plateau are other alternatives of amusing yourself during your honeymoon destinations in Khandala. There also exist parks such as Shivaji Park and Ryewood Park that showcase vast expanse of beautiful green lawns. Rajmachi Park and Lohagad Darshan are other parks for spending your love filled days. And together, they make an important part of your Khandala holiday packages for honeymoon. Other prominent attractions of Khandala include Duke’s Nose delineating the characteristics of the nose of the Duke of Wellington. The Celebrity Wax Museum is also worth visiting, which was brought into existence by Sunil Kandaloor. Moreover, your honeymoon tours of Khandala also take you to captivating spots such as Shooting Point or Amrutanjan’s Point. You both can hold hands and reach Tiger’s Leap, lying at an altitude of 650 meters to bask in the mind boggling beauty of the surrounding valleys. And after viewing Tiger’s Leap, you can make it a point to visit the popular Shivlinga, which lies in the proximity of Tiger’s Leap. So, get ready to be more romantic during your honeymoon in Khandala. Above packages are inclusive of breakfast, lunch & dinner.